Just when you thought that solar-powered desk calculators were the end all and be all of the device’s evolutionary branch, along comes a water-powered calculator that defies conventional wisdom. Runs on water – no need for a light source! 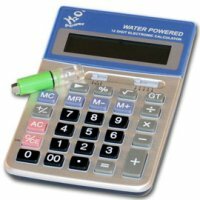 Plain tap water powers this unique, H20 desk calculator! Add a few drops of water to the removable battery and insert it in the calculator for up to three months of use. When the display begins to fade, just refill the battery! It’s more reliable than a solar-powered calculator – and friendlier to the earth, too. Go green with the $24.95 H2O Desk Calculator today. I am sick to the back teeth of seeing things like this promoted as being powered by water. The water is doing nothing more than function as an electrolyte in an otherwise ordinary cell battery. It’s as environmentally friendly as a non-rechargeable Ever Ready battery.